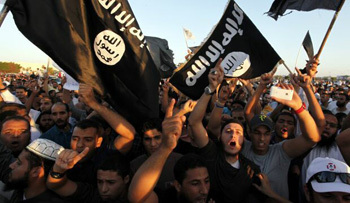 With the events we are watching unfold in Europe, and most all of the Middle East, and the constant attacks on peoples of many other nations, including the United States, there is much concern and discussion in our country and, indeed, all over the world about the war being waged by "Muslim radicals" on behalf of their Religion of Islam. This is a war against all people who are not of, or do not support, the Muslim faith and their Sharia Law. Make no mistake about it, we are under attack by Muslims. If anyone speaks of Muslims waging this war without saying "Islamic Radicals," they are chastised rather harshly for not being politically correct in their failure to use the term "Radical" with Islamic. 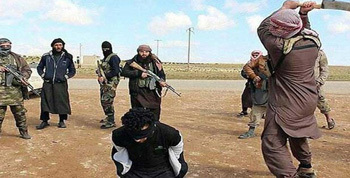 Have you ever wondered why the so-called moderate Muslims who may not embrace terrorism do not speak up in outrage against what is being waged in the name of their religion, Islam, and put a stop to it? I submit to you this answer: It is because they are not the devout Muslims. Those who are waging this war of murder and other atrocities are the devout Muslims who are true to their faith and the teachings of their 'Holy' Koran. They are indeed radical because the Religion of Islam is a Radical Religion. Islamic Radicals and the Religion of Islam are one and the same. 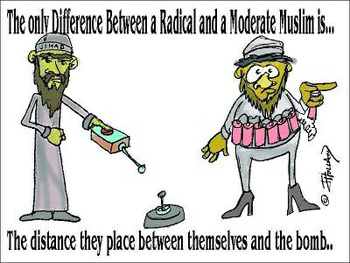 Moderate Muslim only means you are not a true and devout Muslim, guided by the teachings and commands of your Holy Book, the Koran. I challenge the claim that the Islamic religion is a religion of peace. Their definition of "religion of peace" is only the end result of winning the war they are waging, when all of mankind will be under the Islamic Religion and their Sharia Law, by means of either conversion or death. The true and devout Muslims believe that when every person on earth who is not a follower of Islam has been either converted or killed, the world will be at peace, thus their "religion of peace." I state without reservation that all Muslims who are dedicated to their 'faith' and the teachings of their Koran have the total destruction of all nations with secular constitutional forms of government, such as the United States, and the implementation of Sharia Law within those nations as their goal. Yes, I am speaking of it as a religion. It is the goal of the Muslim religion of Islam!! It is not only a religion but a form of government with its own laws called Sharia, which is a very evil thing in itself. It is the only religion in the world which has an overriding goal to control and dominate all human beings on earth, unlike Christianity, Judaism and the other Eastern Religions. There is no other religion on earth that seeks the level of power and authority over every person on this planet as does Islam as a religion, and through deadly force if that is what it takes. If we are to survive by winning this war, it is an absolute necessity that we must recognize this most powerful and fundamental difference between the Muslim religion of Islam and the other religions of the civilized world. Ladies and gentlemen, we are at war. It is World War III. When our nation is at war, who is, constitutionally, the Supreme Commander of our efforts to defeat our attackers? It is our president. No other American President has ever been so partial to Muslims and their Islamic Religion as President Barack Obama. He will not refer to our attackers as who and what they really are. He just cannot bring himself to say the words, Islamic terrorism – nothing as to their real identity. What does this say about our chances of survival in the United States when our Commander in Chief refuses to publicly recognize who we are fighting? Every world leader of good standing has now declared that they are against the actions of Islamic terrorists, except one, President Obama of the United States. The events we are watching unfold in Europe and the Middle East, the beheadings of Americans by the Islamic State and other such murders and mayhem, without our President becoming engaged by recognizing the enemy, are arousing concerns by many over whether President Obama might in fact be a Muslim. I do know, by thorough research, there is an Islamic doctrine known as "taqiyya" that permits Muslims to deny they are Muslim should it be dangerous not to, or to knowingly deceive infidels (anyone who is not a Muslim). Ask yourself, do you believe Barack Obama is capable of lying, of being deceitful to achieve an end? 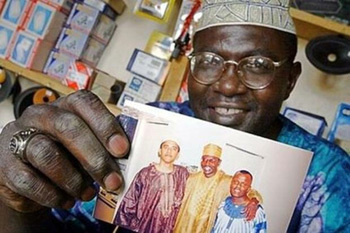 No, I cannot prove that Barack Obama is a Muslim. However, he has never made a secret of the fact that both his father and stepfather were Muslims. It is well documented that when he lived in Indonesia he attended a Muslim madras until he was 10 years of age, a school devoted to the Muslim faith of Islam. Many of us have seen his interview with George Stephanopoulus, when Obama said "John McCain has not talked about my Muslim faith," and Stephanopoulus was quick to suggest to Obama that he meant to say his "Christian faith"? Obama quickly responded, "Yes, my Christian faith." Can you imagine any Christian you know under any circumstances accidentally calling himself a Muslim? Again, no, I cannot prove Obama to be a Muslim. He has publicly referred to the Muslim call to prayer as "one of the prettiest sounds on earth at sunset." Also, publicly he has recited its opening lines with a perfect Arabic accent saying "Allah is supreme... I witness that there is no God but Allah." Is Barack Obama a Muslim? I think in his heart of hearts, he is. What do you think? Judge for yourself. What we are witnessing today in France, other countries of Europe, Australia, Iraq, and Syria will spread into the United States. We absolutely must stop thinking, "That can't happen here." I assure you if we don't enlighten ourselves and put an end to the political correctness out of fear of offending someone, it can and surely WILL happen here. The issue has now become front and center in our current presidential race. We must be very careful and deliberate in our decision. After all, it is up to us. Muslim Immigration or Muslim Invasion?